Sykes has been seen on several television shows over the past two years. Last year she made a return to HBOs Curb Your Enthusiasm starring opposite Larry David. In 2010 she starred in her own late night talk show on FOX, The Wanda Sykes Show. In October of 2009 her second HBO stand up special Ima Be Me premiered. It was taped at the Warner theatre in Washington DC where she tackled topics like the first black president, gay cruises, being a new mom and aging. The special was nominated for two 2010 Primetime Emmy awards: Outstanding Variety, Music or Comedy Special and Outstanding Writing for a Variety, Music or Comedy Special. July 2012 she was heard in the animated feature Ice Age: Continental Drift as Granny. In 2010 she was heard in the Fox animated feature Rio as the Goose. Her first HBO comedy special Wanda Sykes; Sick and Tired debuted in October 2006 and was nominated for a 2007 Primetime Emmy for Outstanding Variety, Music or Comedy Special. It was taped in Seattle Washington and covered everything from racial profiling to gay marriage. Sykes was seen in the feature films Evan Almighty, the sequel to Bruce Almighty, in which she co-starred with Steve Carell, the New Line feature Monster-In-Law starring opposite Jennifer Lopez and Jane Fonda, and was heard in the animated feature Over The Hedge for Dreamworks as well as The Barnyard for Paramount Pictures. Sykes starred and produced the Comedy Central show “Wanda Does It” where she tried various non- showbiz jobs. Her first book titled Yeah, I Said It, published by Simon and Schuster, hit bookstores in September 2004. Yeah, I Said It is a hilarious collection of essays touching on life, family and current events. In the fall of 2003 she was seen on Fox’s “Wanda at Large” which she wrote, produced and starred in. She also has a one hour Comedy Central special called “Wanda Sykes: Tongue Untied”. In addition, she can be seen on HBO’s “Curb Your Enthusiasm” or heard on Comedy Central’s “Crank Yankers as the voice of Gladys Murphy. Wanda was born in Portsmouth, Virginia and raised in Maryland. She graduated from Hampton University. Her stand-up career began at a Coors Light Super talent Showcase in Washington, DC where she performed for the first time in front of a live audience. She spent 5 years as part of the HBO’s critically acclaimed “Chris Rock Show.” As a performer and writer on the show, she was nominated for three Primetime Emmy’s and in 1999 won the Emmy for “Outstanding Writing for a Variety, Music or Comedy Special.” In 2001, she won the American Comedy Award for “Outstanding Female Stand Up Comic”. She won three more Emmys, in 2002, 2004 and 2005 , for her work on Inside the NFL for Outstanding Studio Show – Weekly- Inside The NFL”. Do you want to hire Wanda Sykes? Directly request a quote. In 48 hours we can send you the availability of Wanda Sykes If you would like to book Wanda Sykes, Entertainment Booking Agency is the right place. 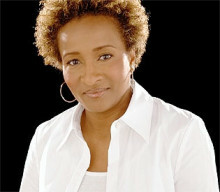 We will offer you the best price and contact the management or we directly contact Wanda Sykes. For corporate appearances or speaking engagements you can contact our agents and the will help you true the process. Tags: hire Wanda Sykes, Wanda Sykes booking, book Wanda Sykes, Wanda Sykes appearances, find more information on booking Wanda Sykes for appearances, Wanda Sykes speaking engagements, Wanda Sykes endorsements/spokesperson, Wanda Sykes appearance fees, Wanda Sykes booking agency contact info, biography of Wanda Sykes, Contact an artist booking talent agent find a speakers bureau that can book Wanda Sykes, speaker booking agency for Wanda Sykes, Wanda Sykes booking agency, Wanda Sykes booking for corporate event. EBA is one of the biggest entertainment booking agencies in the World. We book hundreds of celebrities, artist, athletes and speakers in a year. Important to know is that we are not claiming to be the management of Wanda Sykes. We are not the official agent for Wanda Sykes. Companies from around the globe book these artists and speakers true our company be course we have one of the biggest networks and we always have direct contact with the artist or the management. We help you to find the right celebrities for your corporate of private events. Please contact one of our agents to get free advice and we will help to get the world-famous artist on your party.